Jammu and Kashmir Police released a new recruitment notification for the Constable vacancies in border battalion. Govt job aspirant of this state who highly prefers in police job can check this FreeJobAlert to participate. Free Job Alert service collected some important information and discussed here for our readers. 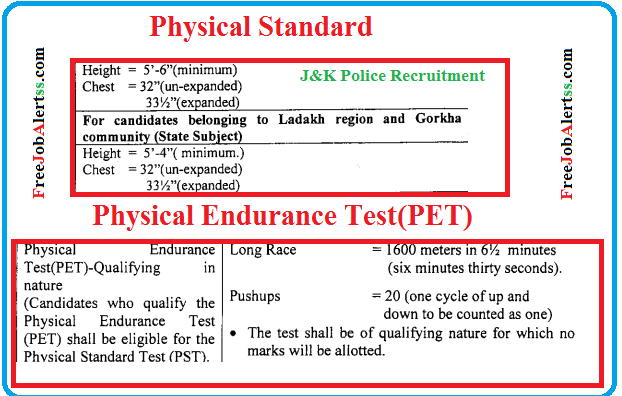 Look at below one by one important information of J&K Police recruitment of Constable vacancies. Get Phisical standard and Physical Endurance Test. To participate in this vacancy the participant should be 10th standard qualified from any recognised board. First name and vacancy details: Jammu and Kashmir Police recruit total of 58 Follower Vacancies. Category wise vacancy details are noted below. ■OM-32 ■RBA-12 ■SC-06 ■ST-06 ■ ALC-02 ☻ Total 58 Follower vacancies will be filled by this J&K Police recruitment 2018. Education qualification: If you want to participate for this follower vacancies recruitment of Jammu and Kashmir police, then you should be qualified minimum matriculation exam(10th Standard) or equivalent for a government board/council. Also, the candidate has to fulfil the physical endurance test and physical measurement. Application fees: to participate in this follower vacancy, candidate have to pay rupees 200 as application charges. Last date of application submission: a candidate who can fulfil the eligibility criteria and interested to participate in this JK Police recruitment of follower vacancies, Candidate should have completed his application submitted on or before 16th July 2018. Official notification & Website: FreeJobAlert service provided official notification link of this recruitment of follower vacancies and also providing the official website address. I hope that you got all the important information of JK Police recruitment notification in short description. If you searching for more Sarkari Naukri or other govt and private jobs then we can help you that. Look at below we already discussed some other popular recruitment and make Free Job Alert to all readers. Don't forget to share this Job Alert to your friends. May your friend waiting for this job alerts from you.